Soledad Division Headquarters, County Forestry Dept. 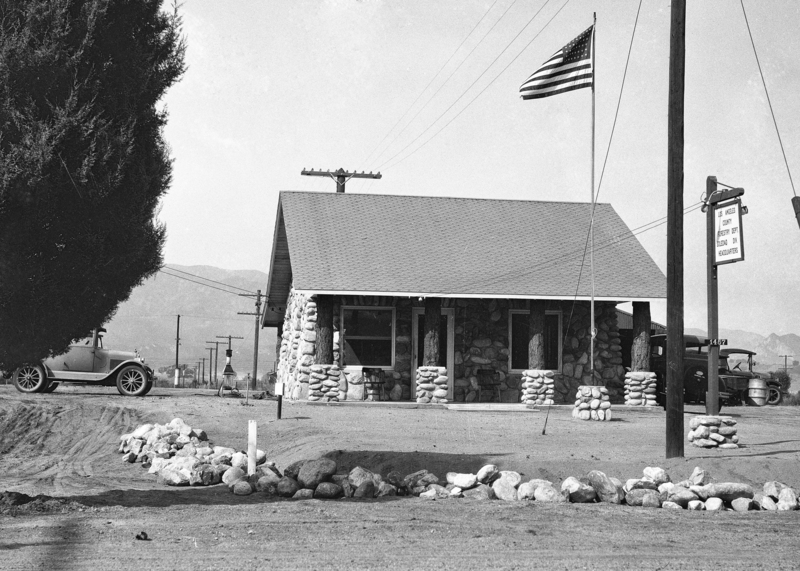 Soledad Division Headquarters of the Los Angeles County Forestry Department at 1457 San Fernando Road in Newhall. According to Brunner's 1940 history, this structure was erected during the winter of 1928. Between 1948 and 1954, the County Department of Forester and Fire Warden, Fish and Game and Fire Protection Districts consolidated to become the Los Angeles County Fire Department. As for 1457 San Fernando Road, the address was renumbered in the 1950s and renamed in 2008. In the 1950s this building was replaced with what's now Fire Station 73 on the north side of this same property (roughly where the photographer is standing), which current address is 24875 Railroad Ave.
FD2801: 19200 dpi jpeg from jpeg courtesy of Fire Capt. Paul Peppard, Station 73, Los Angeles County Fire Department, 2014.